About i-sells Delivery Information Returns Information Price Promise Terms and Conditions Privacy Trade Accounts Review i-sells.co.uk About our cookies Where are we? What is Safe or Standard? Safe metal ducting contains rubber seals while standard metal ducting does not. Bathroom zones, what are they? Bathroom zones are just a way of telling which extractor fan you can install in a specific place. Availability: up to 14 days Extended What's this? Please call us on 020 8463 9696 or place orders online by midday Thursday 20th December 2018. Will be limited only to online queries, please allow up to 48 hours for a response. All orders are subject to availability. Please call us on 020 8463 9696 to check availability or likely despatch date. Closes: 4:30pm Thirsday 20th December. Excludes Highlands, Islands, and Certain Postcodes. Please Note: Ducting tubes over 200mm in diameter and 3 metres in length may incur additional shipping charges. Male spigots will slip inside female sockets or spiral duct pipe. A female coupling will be required to join two male fittings. Fittings should be secured using the appropriate fixing method. 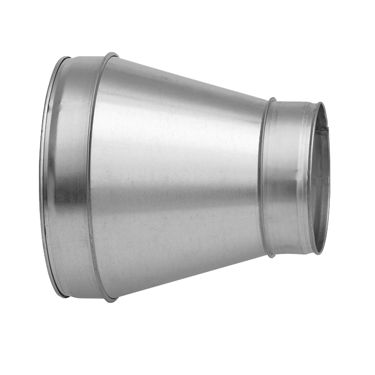 Long Reducers are made to order with a lead time of 5 - 20 working days - Alternative reducer styles are available. Please contact us for full details. Our fittings are produced in accordance with DW144, and have a rolled edge for safer handling and improved alignment. Questions and Answers, do you need more information about this product? Your question will be sent to a member of our team. We'll email you the answer and post it on this page. If your question is about an order you already placed, please use our Contact Form to reach the customer service team. The UK's Leading Ducting & Ventilation Supplier Since 2007!